Your timing chip is attached to the back of your race bib with a piece of protective foam covering it. Please DO NOT REMOVE the foam or timing chip from your bib. All you need to do is pin the bib to the front of your shirt on the day. If multiple bibs have been sent to the same address, please check the back and a name will be on each bib. If you have registered for multiple events, please ensure you wear the correct bib when participating in each event. Oatley Park is situated in the southern Sydney suburb of Oatley West, which is 18km south of the city centre and 4km from Hurstville. Need an overnight stay near the start? View accommodation options. The major roads to access Oatley are the M5 Motorway and the Princes Highway. The start/finish area is located at the main entrance to Oatley Park, which is situated at the end of Oatley Park Ave (Cnr Dame Mary Gilmore Rd), Oatley West. For parking information click here. The Eastern Suburbs & Illawarra Rail Line (Waterfall/Cronulla/Bondi Junction) provides frequent services to Oatley and Mortdale stations. 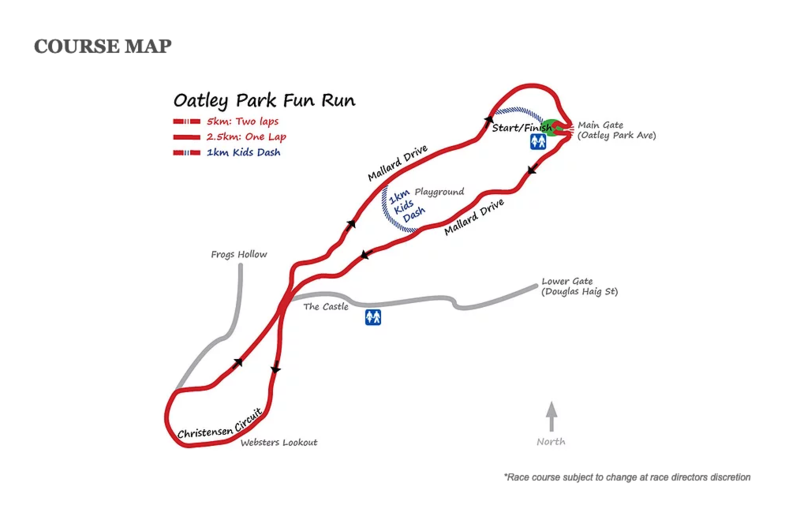 Oatley Station is just 1.5km from the start and the short walk provides an ideal warm up to the event. Trains arrive every 30 minutes. Mortdale station is a little further at 2.2km from the start but is serviced approximately every 15 minutes. Visit CityRail to find out exact train times and to check any track work scheduled on the event day on the line servicing Oatley/Mortdale. Local on street parking is available as well as limited parking within Oatley Park, subject to time and traffic control. Use Douglas Haig Street for parking within Oatley Park on event day. The southern (Oatley Park) end of Douglas Haig Street and Lloyd Street have a pedestrian pathway leading directly up to the main entrance of Oatley Park on Oatley Park Avenue. Using this path will save you time walking to the start if you have parked in these streets. You can also park in Pamela Avenue, Peakhurst Heights, and walk via a fire-trail to Dame Mary Gilmore Ave and the main entrance of Oatley Park. Please consider local residents and do not block driveways. Available on site at the start/finish area. Also available near "The Castle", situated a few minutes walk from the start, adjacent to the lower carpark accessible by road via Douglas Haig Street or by foot from the main start/finish area. Free minding of your bags at the start/finish area will be available whilst you participate. Your bib number will be attached to your bag. Bag minding is located next to the BBQ stall. Available at the Oatley Baths within Oatley Park. Take the low road or the pedestrian stairs down to The Castle and then down to the river frontage (Caution: steep descent). These facilities are approximately 300 metres from the start/finish area down on the river. The showers are cold only. Prams are welcome. The majority of the course is on a sealed (traffic-free) roadway; the start/finish area has some grass and gravel. We do ask that you start towards the rear of the field for safety reasons. If your kids can walk then you may want to consider entering them in the 1km Bupa Kids Dash. St John First Aid officers will be on duty at the start and finish lines. You can purchase freshly brewed coffee and cold drinks from our mobile vendor on the day. You can view the location of sponsor marquees, BBQ, First Aid and other services on the start/finish site plan. There is a large childrens playground at Steamroller Park within Oatley Park. This can be accessed from the southern end of the main start/finish area by sealed pathway. It is approximately 150 metres from the toilet block located adjacent to the finish line. See "playground" on the Course Map. If you'd like to stay overnight near the race venue of Oatley Park, you can view nearby accommodation options. Q: Can I run with my child in the 1km Kids Dash? A: You are welcome to run along your child in the 1km Kids Dash and do not need to register to do so. The maximum age when registering for the 1km Kids Dash is 12 years old so you will not be able to register or receive a time however, it is fine to run along with them. Q: Can I enter my family in different events? A: Family discounts are only set up for the same event which are all listed on the Race Info page. If you are registering your family across different events you will not be able to receive the family discount unless it meets the requirements listed which is 2 Adults and 2 Children (under 18) for each event. Q: I registered in time for the bib mail out, when do I receive my bib? A: If you registered online before midnight Sunday the 8th of April you will receive your bib via mail. You should receive your bib within a week of this date. Q: When do online registrations close? A: Online entries close 10:30pm Saturday the 28th of April. If you miss, this there will also be the option of registering on the day or the day before the event on Saturday the 28th from 9:30am - 11:00am at Oatley West Public School. A: On the day entries will be available. However, we do recommend registering online beforehand to save time on the morning then you will then be able to pick up your bib on the day or take advantage of our bib pick up on Saturday the 28th from 9:30am - 11:00am at Oatley West Public School. Q: What are the event start times? A: The start times are all listed on the Race Info page. 1km Kids Dash - 8am, 2.5km - 8:30am and 5km - 9am. These are the times that the start gun will go off so please arrive 45min prior to your event to ensure you allow enough time to pick up your bib and for lining up and race briefing. Also be sure to allow extra time for parking. A: You are more than welcome to run with your dog, please just be mindful of other runners coming past and move to your left to let anyone passing through. Q: What charities are involved with the event? A: We takes pride in not only promoting health and fitness in the local area but also being able to give back to the local community by making donations to various charities through some of the money our event raises. This year we will be making a donation to support the local Cerebral Palsy Alliance center at Penshurst and the fantastic work they do there. How was Oatley Park Fun Run?